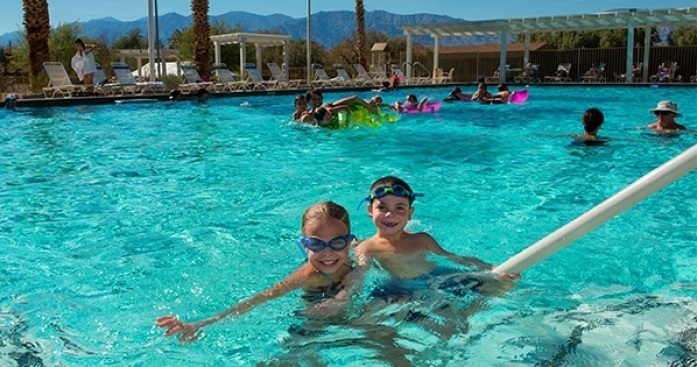 Dry heat + a quick getaway: The Ranch at Furnace Creek is open. A spring-fed pool in the middle of Death Valley National Park? Find it at the Ranch at Furnace Creek, which remains open throughout the toasty desert summer. TOASTY DAYS, SPRING-FED WAVES: California and Arizona have been longtime neighbors -- no spoiler alert needed, we'll presume -- so it hurts us, just a tad, to borrow an Arizona-ism that is very much associated with the Grand Canyon State. "But it's a dry heat" is practically the official state motto, and if it one day starts to show up on license plates and letterhead, we won't be at all shocked. So Zonies -- and we call Arizonans by their zany nickname with all love -- might be a mite mad to see us using "but it's a dry heat" for some places based within the Golden State. "You don't know a hot day!" they may counter, thinking of our beaches and fog. Ah yes, but then we counter back "have you been to Death Valley National Park?" and then the discussion ends. FURNACE FUN TIMES: For Zonies know, and Californians know, and everyone knows that Death Valley can lean towards the toasty end of the thermometer, and absolutely definitely during the summertime. But summertime doesn't mean the national park hangs the "See ya in winter!" sign. On the contrary, The Ranch at Furnace Creek stays open through June (warm), July (scorching), August (wowee it's hot), and into September and the rest of the year. One of its secrets? It has a spring-fed pool, one that is bound to see some fun family times come the long weekend of Labor Day. OTHER ACTIVITIES ABOUND... beyond the pool's edges -- horseback riding, bike riding, and such -- but every guest wants to feel that spring-fed-a-tude that comes with a cooling dip. The natural springs help the resort with its admirable water conservation efforts, efforts that also apply to the Ranch's sister property, The Inn at Furnace Creek. The Inn keeps off-and-on hours in the summer, that are limited, but reservations are now being accepted for its early-October re-opening. The Inn, like The Ranch, also boasts a spring-fed pool, which sounds quite storybook-like, like an oasis, for such a stark desert setting. Summer isn't yet over, and you can still tell people "I'm going to Death Valley for Labor Day Weekend -- it's a dry heat!" If you tell them about your days spent in the spring-fed pool, though, in the middle of the arid landscape, they may just think you've read too many tall tales. But this one is true.